As I started to take snapshots of Alexandria's Rialto Cinema, which has now been demolished, I was stopped by a harsh voice, "No, no photos are taken here." Indeed, "No photo" expresses how Egyptian heritage is being deleted from the urban landscape. This is just an example of what Alexandria, Egypt's old cosmopolitan city and culture hub is going through these days. 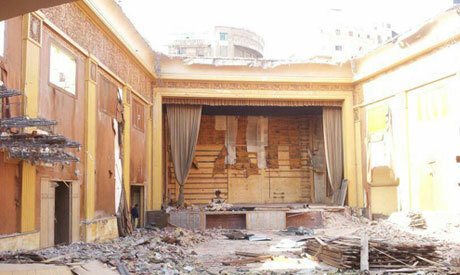 In a blink of an eye, one of the oldest cinemas, not only in Egypt but in the whole world, with its 1,205 seats vanished. Rialto Cinema, located in 36 Safya Zaghloul Street, an area full of historical buildings and restaurants, was completely demolished last month by a new company, which bought the building. The movie theatre enchanted the audience with films of the golden cinema era during a time when people dressed up in their evening gowns and enjoyed the glamour and magic of cinema. The cinema was owned by a Greek resident of Alexandria who recently sold it to a real estate developer. The agreement was to renovate the cinema, as was done to Amir and Rio theatres. However, the Greek community was shocked to find the cinema demolished in order to build a 'Rialto' mall that will include a cinema. Rialto Cinema was built in the late 19th century with distinguished art deco. Though there is no clear evidence on when exactly it was built, an old map of Alexandria posted on the Save Alexandria website, one of the largest initiatives that works to save the old city's inheritance and artistic legacy, marks Rialto's presence in the late 1930s. "I grew up when the cinema was in its prime during the 1940s and 50s. I remember seeing renowned singers Abdel-Halim Hafez and Shadya, actors Kamal El-Shenawy and Faten Hamama as well as musical composer Farid El-Atrash attend the premiers of their films in this cinema," said Mohamed Abdel Baset, a seventy-year-old doorman in El-Raml neighbourhood. The art of cinema is deeply rooted in the heart of the Mediterranean city that witnessed the first cinema screening in 1897, built the first cinema studio in 1907, and published the first cinema magazine in 1919. It is not the first time a historical building is demolished. According to Save Alexandria, more than 2,500 buildings were destroyed. Hundreds of them represent more than such a building and were classified as "old buildings and constructions that cannot be destroyed as part and parcel of Alexandria topographies." Despite the rage of Alexandrians, their demonstrations against its destruction were unfortunately not backed by any legal action. They realised there was no law to prohibit the demolitions of old cinemas. Moreover, Sayed Fathy, head of the Cinema Chamber news headlines, highlighted that Rialto is currently owned by a company which has every right over the building. The Cinema Chamber does not have any control over the cinema anymore. Though local residents seem to have lost this battle, their efforts have helped save other architectural gems. They were successful to save Alexandria's Circurel Villa because it was government-owned. In addition, the Circurel neighbourhood, as a whole, prevented the demolishing process. Local residents made human chains to prevent bulldozers from destroying the building, stressing on the need to preserve the villa. Unfortunately, in Rialto's case, people were shocked to find the building demolished overnight. Drastically speaking, Rialto is not the first cinema to be demolished. Cinema Sporting, Fouad, Kosmo, Majestic, Odeon, and Legate, to name a few were also knocked down. However, there are other cinemas that were renovated, such as Amir, Royal and Metro. Despite the lack of accurate dates, Save Alexandria documented about 25 old cinemas that were demolished and five that were renovated and restored. In addition, a video clip by Save Alexandria demonstrates how the demolition of Rialto took place. The documentary video was conducted by Sara Swidan, Ghada Essam and Muhammad Nabeel. "It is a process of disfiguring every beauty that lies in the city. Anyone who visits Alexandria will notice that our buildings have become cemeteries. Instead of breathing beauty, we breathe debris," said Mohamed Desouky, an architect and one of the founders of Save Alexandria. "Save Alexandria has done dozens of stands, seminars, and human chains to prevent destroying [our] archaeological heritage," stressed Desouky. However, they cannot stand day and night in front of every building in Alexandria. They protected many buildings like Cicurel and Baron Villas, but were not able to save many as well, such as Villa El-Naquib and The Greek Club in Alexandria, which was once located in Ibrahimia district. "We are doing our best. We need authorities to help us, even for a short period, like six months, to stop demolishing villas and stop constructing. Is that too much for Alexandria?" Mohamed Abu El-Kheir a co- founder of Save Alexandria initiative exclaimed. The beginning of the Alexandria DESTRUCTION . Is the beginning of the economical influence , against the OLD COSMOPOLITAN CINEMA OF ALEXANDRIA CITY . how to protect what's left? Some only care for profiteering, others (I've heard this more than once!) would gladly see the pyramids bulldozed to the ground and replaced by housing for low-income Cairenes. All are simply light-years away from understanding the importance of history and heritage. Poor, poor Egypt! Unless the top State authorities take the matter seriously in hand historic buildings will not be saved. Unfortunately, the government has more immediate problems to solve - poverty, education, unemployment etc..
Hello Henri , believe you are the Old Victorian who lived in Alexandria , and whom we lived in his fathers villa , at 38 Saba Basha ,Alexandria. I was born in Alexandria and lived at Cleopatra near Sidi Gaber railroad station.I went to St. Marc also and we left Egypt in 1961. Alexandria was my life. I went back a few times but will never go again to see how it's current people are destroying the beauty that Alexandria had during our time. Rialto brought all Warner Bros. movies from Hollywood for us to watch like the Metro for the MGM movies and Amir for the 20th century Fox. I want to keep in my memory the beauty and the memorable youth we had in Alexandria. I don't want to say a dirty word. but the responsibles are all dirty no- responsibles, that get bribed bribed bribed .